Remember When…The Frat Pack was Awesome? The Watch was released this past Friday. As many people expected, critics tore the movie apart and it earned an overall rating of 15% on Rotten Tomatoes. Yikes. 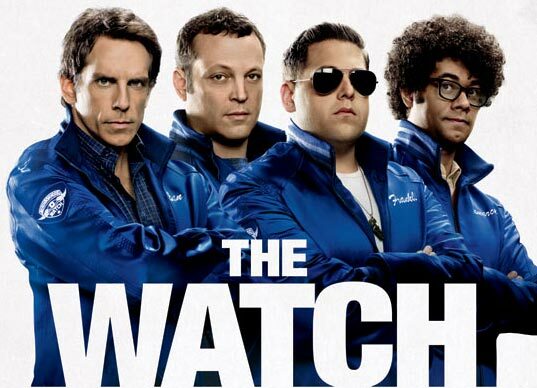 Starring Ben Stiller, Vince Vaughn and Jonah Hill, The Watch follows four regular guys who discover that their town is being overrun by aliens posing as ordinary suburbanites and they have no choice but to save the suburbs from the alien menace. The movie’s premise isn’t promising, which is unfortunate since the script was penned by Seth Rogen. The only selling feature for audiences was that “Frat Pack” members were in it. “The Frat Pack” is a group of comedians that includes Jack Black, Ben Stiller, Luke Wilson, Owen Wilson, Vince Vaughn, Will Ferrell and Steve Carell. Some honourary members or “Junior Varsity” are Jonah Hill, Seth Rogen, James Franco and Justin Long. The term “Frat Pack” was coined after 2003’s Old School – a movie about three men (Vince Vaughn, Luke Wilson and Will Ferrell) who decide to relive their college years and start a fraternity. When it was released, Old School was financially and critically successful. Thus “The Frat Pack” was born. There’s never been a movie that starred all “Pack” members but with this group of comedians constantly collaborating, their numbers continue to grow. For a few years audiences were treated to hilarious movies. Some of the best movies include Dodgeball: An Underdog Story, Anchorman: The Legend of Ron Burgundy, Wedding Crashers and my personal favorite Tropic Thunder. In the last two years though, “Frat Pack” members have been making garbage i.e. Megamind, Little Fockers, The Big Year and now The Watch. I’m not saying these actors aren’t funny: I’m saying they’re lazy. It feels like they just want an excuse to get together and screw around. Since they have star power on their side, it doesn’t matter to them if their movies are good or not. Stiller, Hill and Vaughn don’t seem to care about The Watch’s reviews because they figure it’ll be a commercial success. So it’s time to teach them a lesson. Don’t go see The Watch or any of their new movies until reviews are released. Let one of their movies flop – HUGE. It’s time they see audiences want quality, not quantity. Hopefully, one major box office failure will make “The Frat Pack” realize they have to work for our money. Nobody wants to see The Watch. I’d rather see Simple Jack.